For close to thirty-five years I have owned albums by the incomparable Israeli composer-singer, Chava Alberstein. Tonight I heard her live for the first time. It was a tremendously moving experience, not just for her singing, which has only improved with the years -- great singers never fade away; they merely grow old -- but also because it transported me in time to a different Israel, and to a different me. Of course, if you live long enough, the wheel of mazal turns, and it has turned with Alberstein. 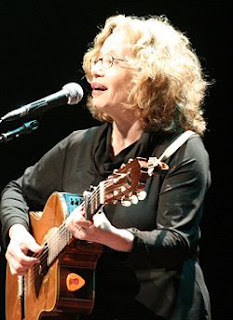 Her place in the pantheon of great Israeli artists is assured; she continues to record, and she even appeared for a round of performances recently in Israel. (She also picked up an honorary doctorate from Tel Aviv University.) Her songs, especially the love ballads and lullabies, because they are so intimate and poignant, are timeless and universal. Tonight her program consisted mostly of those songs, with only one recent social commentary song about a foreign worker from Bucharest. Appearing with her guitar, and two backup players, she was letter-perfect in her delivery (perhaps a bit too perfect; her professionalism and depth made up for a certain lack of spontaneity). She certainly was a crowd-pleaser. For me, there was only one sour note, and that was her singing of her signature songs, Naomi Shemer’s Lu Yehi (“If it would be”). Like many others I heard Chava sing that song for the first time on the television after the outbreak of the Yom Kippur war. It is a song that manages to express the deep longings of the Israelis for peace and for normality, without quite understanding why things are as the way they are. It is a beautiful song, but tragic in its sheer cluelessness, and speaks volumes about the Israeli feelings of helplessness and passivity. Like other liberal zionists Alberstein had a period of active protest that started with the first intifada and ended, more or less, with the suicide bombings (although she regularly appears with Palestinian artists.) Her peace activism was important in its day, as was that of Oz, Yehoshua, Brinker, Reshef, and others, as well as that of organizations like Peace Now, etc. I have a great deal of admiration and nostalgia for that crew. I certainly marched in my share of Shalom Akhshav marches and attended their rallies. But the Old Left in Israel has long outlived their usefulness (except for their money-raising potential), and it is no wonder that Dror Etkes packed his bags and left working for Peace Now’s settlement watch. The younger generation of activists are not to be found in Peace Now, or Noar Meretz, but rather in the activist organizations that work together with Palestinians on the West Bank and Gaza. These are the organizations described by David Shulman in his book, Bitter Hope, reviewed (and significantly misunderstood) in the NYRB by the “Old Left” Zionist, Avishai Margalit. Of course, Alberstein’s program this evening could be seen as one big protest, since it focused on the personal rather than on the national or the political.